With the abundance of valuation metrics in the world of finance, it can be difficult for investors to gauge relative value amongst different asset classes. The price to earnings multiple on the S&P 500 indicates that equities are fully valued, and some measurements (the Schiller PE or GAAP PE) indicate equities to be overvalued. Meanwhile, treasury yields are at, or near, historic lows. 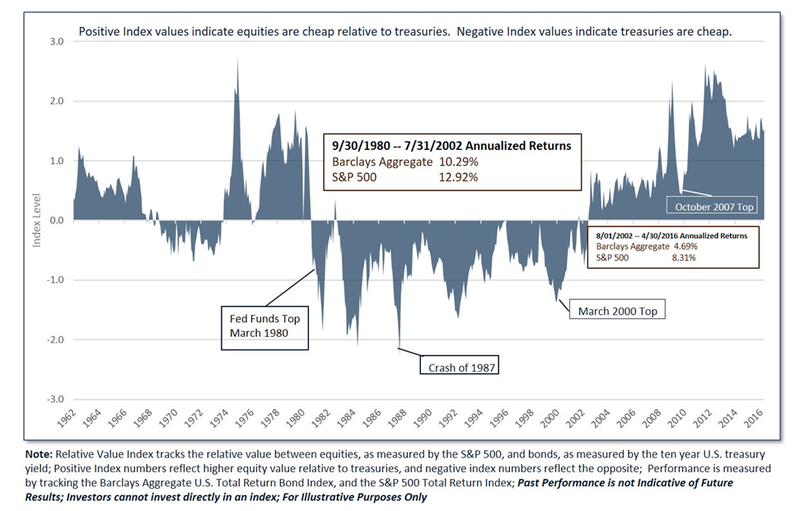 Holbrook has developed a proprietary Relative Value Index that gauges the value of equities relative to treasuries, and it indicates that equities are still cheap. The chart below tracks the Index from 1962 to present. Currently, the index is at 1.4 indicating that the equity market, tracked by the S&P 500, offers considerable value. The index is a tool for tactically adjusting strategic portfolios and as index values increase, equity exposure should be adjusted upward, and vice-versa. When the index is one, it implies that a balanced portfolio of 50% U.S. equities and 50% U.S. treasuries should be adjusted to 60% equities and 40% treasuries. At negative one, a balanced portfolio should be adjusted to 40% equities and 60% treasuries. Higher or lower readings imply more substantial adjustments. The performance of the S&P 500, the Barclays Aggregate U.S. Bond Index, a balanced portfolio, and a tactically adjusted portfolio based on the Holbrook Relative Value Index are below. The chart below is for illustrative purposes only, as investors cannot invest directly in an index. The tactically adjusted portfolio has a higher annualized return, with less volatility than the balanced portfolio. It’s information ratio is 1.1 versus .8 for the 50-50 balanced portfolio. Interestingly enough, the historical time frame that most investors recognize as the most profitable period to have owned equities (1982-2000), the Relative Value Index was underweight equities – at times, substantially underweight. It just so happens, that this time period also coincided with one of the most profitable times to own treasuries. 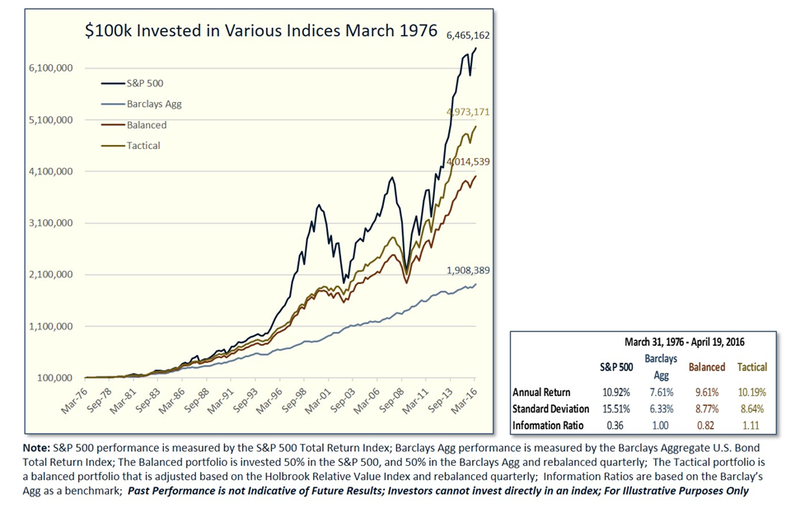 The tactical portfolio invested in 1976 had a higher total value than the simple balanced portfolio 92.5% of the time. In terms of quarterly performance, it outperformed the balanced portfolio 53% of the time. As you can see in the chart, the Holbrook Relative Value Index has been overweight equities consistently since August of 2002.